Westerners practicing judo resembles beasts fighting. Internationalized judo has lost its appeal. In Brazil they put chocolate in norimaki, but I wouldn't call it sushi. Judo has gone the same way. However, doing a search for "chocolate sushi", or even "chocolate sushi Brazil", doesn't seem to provide any info on sushi with chocolate in it being an established item, or at least a trend (akin to deep fried Mars bars in Scotland), in any location's cuisine, as opposed to it occurring only at a particular restaurant. Is chocolate in sushi a thing, and if so, where can I eat it? 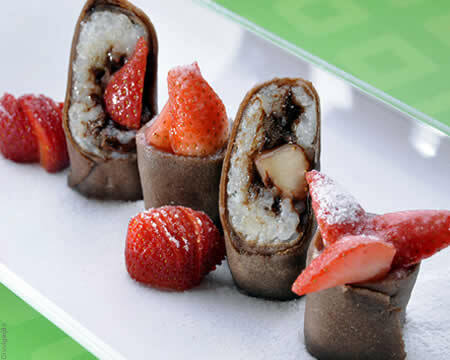 If you do a search with the terms sushi com chocolate (sushi with chocolate) you will find plenty of recepies. Nevertheless, it's certainly not a trend, I have ate sweet sushi before but I had never heard of norimaki with chocolate before. It's really common to find sweet temakis ("sweet kones") for dessert, I wouldn't be surprised to find one with chocolate, but they certainly don't have fish on them :) They are not temaki in my opinion, as they are normally not rolled in nori. It depends on where you are, but I'd search for temaki doce (sweet temaki), along with the name of the city where you are to find places to eat. Try searching for "temaki de chocolate" instead. Searching for '"temaki de chocolate" Brasilia', for instance, got me the Sushiloko chain and a number of other restaurant mentions (I think - I don't speak Portuguese). It looks as if temaki with chocolate and banana, in particular, is certainly not unheard of. Not the answer you're looking for? Browse other questions tagged japan food-and-drink brazil local-cuisine or ask your own question. Where to eat Suzumebachi (Giant Sparrow Bee) in Japan?